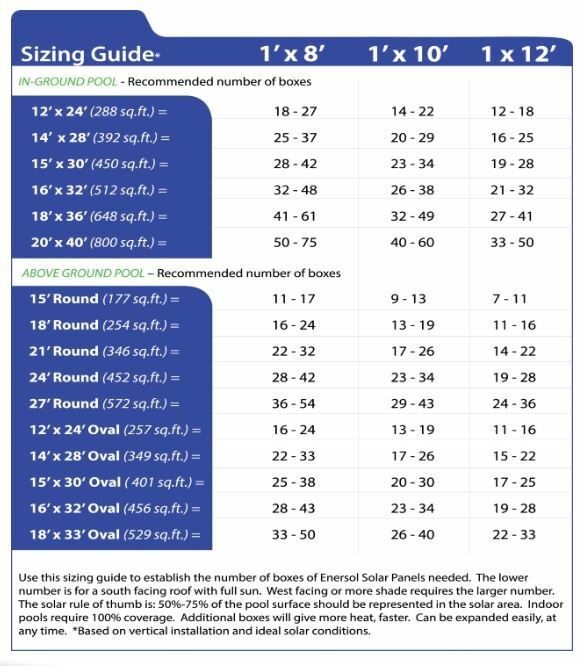 In order to size your Enersol Solar Pool Heating System you need to know the surface area of your pool. Example: A 12ft x 24ft rectangular pool has a surface area of 288sqft. The rough rule of thumb is to size your solar pool heating system at 50-75% of the area of your outdoor pool. Example: If your solar pool heating panels will face South, you will aim for a system with 50% of the surface area of your pool, 144sqft. The length of solar pool heating panels you install will be determined by the surface you are mounting them on. You will need to leave room at the top and the bottom of the panels for piping and access. Example: If you will be mounting the solar pool heating panels on a south facing roof that is 14ft long, you might decide that a 10ft panel is the best length for your roof. The number of 1ft solar pool heating panels you require is determined by dividing the calculated size of your solar pool heating system by your desired solar pool heating panel length. Example: If the surface area of your solar pool heating system is 144sqft and you can fit 10ft solar pool heating panels on your roof, you will require 14-15 boxes of solar pool heating panels for 50% coverage. We do not recommend installing less than twelve 1ft wide panels, as high pressure issues can occur.